Winnie's Wish Cat Rescue & Shelter is in need of all kinds of things: food and litter, medical supplies, bedding, toys ~ funds to spay and neuter ~ and so much more. The everyday daily and special needs of housing and caring for all these "adorable adoptables" while they wait for you and their forever homes. So a Holiday Auction is now underway! A great time to shop for gifts, a great time to shop for your own pets ... just a great time to shop! We were happy to donate the items you see below to this most worthy cause. Each one is in mint condition...and if you're lucky they might even come packaged with a tuft of Mudpie fur!!! The holidays are right around the corner, so why not get a head start on your shopping? 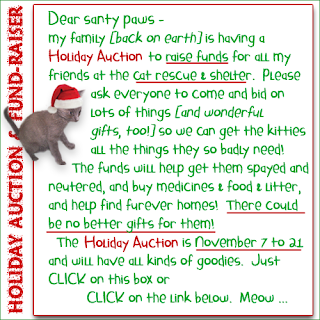 Stop by the auction and check out the list of well over 60 items for yourself, and for the special humans and pets in your life. 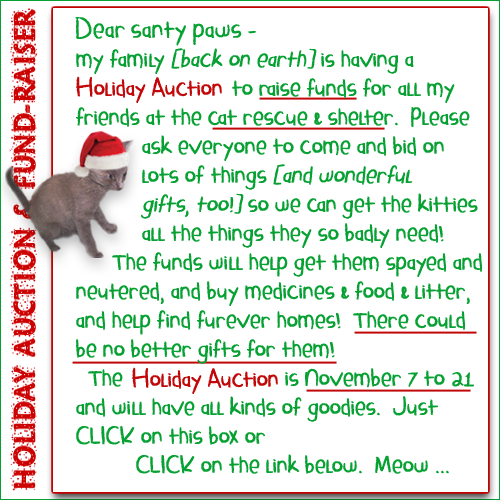 Plus, your bid will be supporting a great cause, so you'll be giving some needy kitties a very special Christmas gift too! There are so many lovely things in the auction for Winnie's Wish. Nice auction items! Hopefully they will help Winnie's Wish continue to help deserving cats. Sure looks like a great auction. 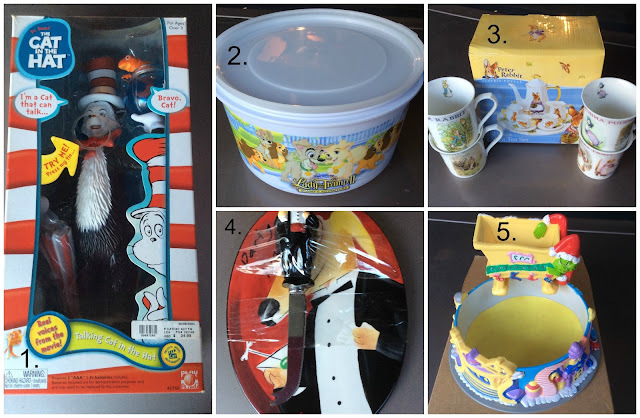 There's a lot of great things to bid on in this auction! What a nice auction! Hurray for helping kitties! - Crepes. Those awe really pawsum Mudpie. It looks like such a great auction! Mommy loves the Cat In The Hat bowl she won that you guys donated. We're headed there next! Thanks for letting us know! That was nice of you to donate. They have lots of great items, something for everyone. Thank you thank you thank you for talking about the auction! And for donating those wonderful items! What cute auction items! TW’s item hasn’t gone up yet. How do you bid on an item? I looked for instructions but I couldn't find any!